SpeakeasyDC and Danny will be hosting a DC storytelling night on stage at Town next week. The event will be March 8, at 8pm at Town. Tickets are $10. Details are here. “I’ve been fixing cars since before most of you were born. I started in Jamaica, where I was born, and have been doing it for the forty years I’ve been living in Washington. I started fixing police cars over at Northeast Ford on West Virginia Avenue. After nine years there, I left to open my own business. My first shop was on 14th and Belmont, and then I moved to Georgia Avenue. “A ways back, I returned to Northeast. Now, they call me the Mayor of Congress Street. I have been working as a mechanic here for a long time….and I mean a long time…..like 27 years long time. I can tell you everything about everything here. When I first got here, there was nothing around here and the place was rough and tough. I knew that one of these days, it was going to get better. It did. “As the neighborhood changes, I get a lot of new customers. Most people find me through word of mouth. I can fix any car out there. If it has four wheels, I can take it apart and put it back together. Now, I work by myself because it is hard to find people with my work ethic. People don’t want to work no more. “See, I am a very picky person. If you can’t work how I work, you can’t work here. I don’t like customers coming back or needing to recheck things. Once a car goes out of my shop, it stays out because I fix the problem. 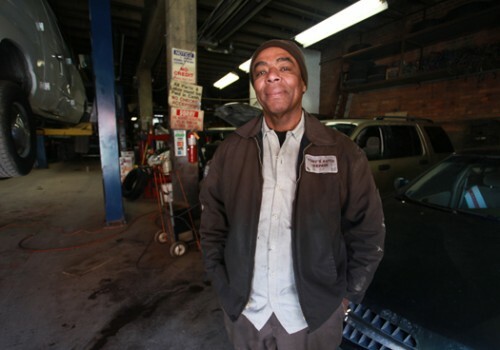 Tony’s Auto Repair is located at 1116 Congress Street NE.